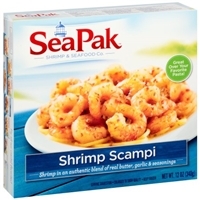 Brand/Manufacturer: SeaPak Rich Products Corp.
Shrimp, enriched bleached wheat flour (wheat flour, niacin, iron as ferrous sulfate, thiamine mononitrate, riboflavin, folic acid), soybean oil, wheat flour, water, yellow corn flour, modified corn starch, contains 2% or less of each of the following: citric acid, corn starch, dextrose, disodium inosinate and disodium guanylate, dried whey, enriched wheat flour (wheat flour, niacin, reduced iron, thiamine mononitrate, riboflavin, folic acid), garlic powder, leavening (baking soda, sodium acid pyrophosphate), methylcellulose, paprika oleoresin, salt, sodium alginate, sodium bisulfite (as a preservative), sodium tripolyphosphate (to retain moisture), soy flour, spice extractives, sugar. 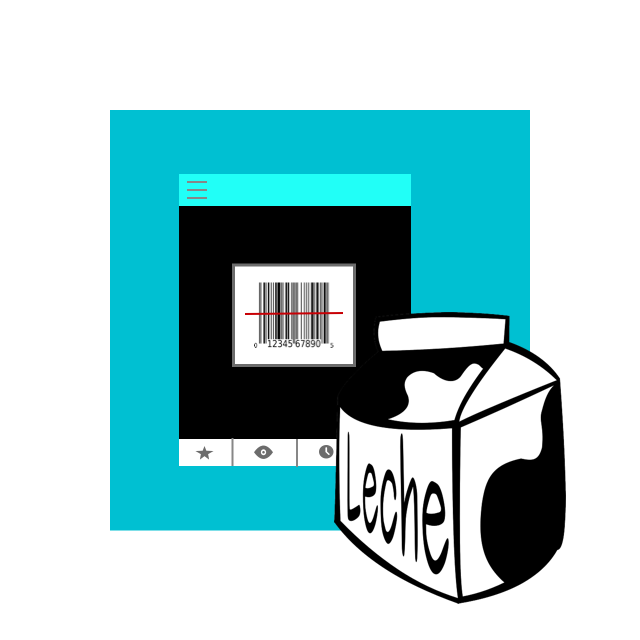 Contains: shrimp, wheat, milk, soy. 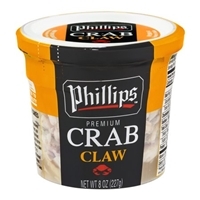 Crabmeat, water, salt, sugar, citric acid, calcium sodium edta, (to promote color retention),sodium pyrophosphate to maintain flavor and firmness, sodium sulfite as a preservative. Shrimp (shrimp, water, salt), butter, fresh lemon juice, garlic, extra virgin olive oil, white wine, fresh lemon peel, parsley, red pepper, sea salt, black pepper. 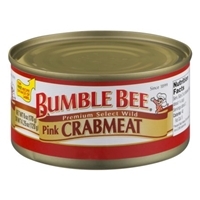 Gluten free.contains: crustacean shellfish (shrimp), milk. 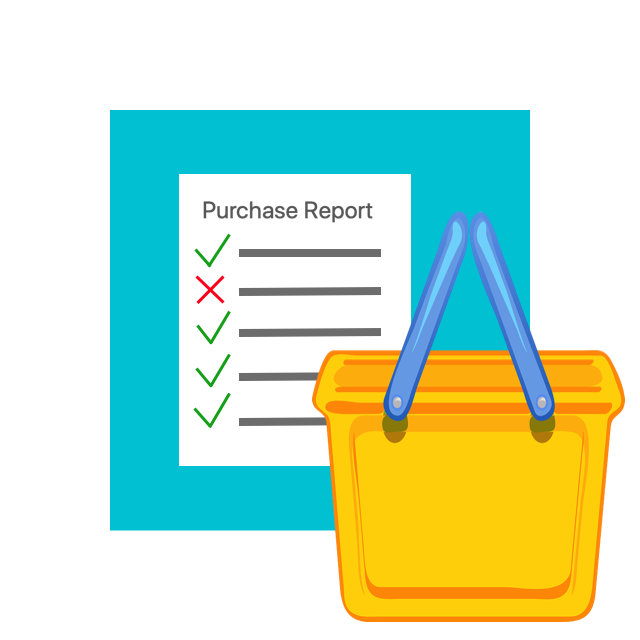 Do not use if pouch is punctured or leaking prior to opening. 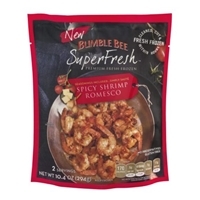 BUMBLE BEE SUPERFRESH SPICY SHRIMP ROMESCO.CLEANED, CUT & FRESH FROZEN WITHIN HOURS.SEASONINGS INCLUDED... 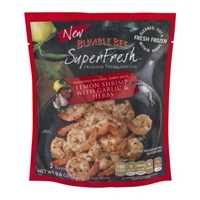 SIMPLY SAUTE.NO PRESERVATIVES.GLUTEN FREE.2 SERVINGS.PER 1/2 POUCH.170 CALORIES.5G SAT FAT, 25% DV. Shrimp (shrimp, water, salt), butter, vine-ripened tomatoes, red wine vinegar, tomato powder, extra virgin olive oil, white wine, garlic, shallots, cayenne pepper, parsley, red pepper, sea salt. 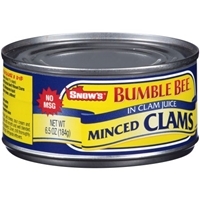 Gluten free.contains: crustacean shellfish (shrimp), milk. Do not use if pouch is punctured or leaking prior to opening. 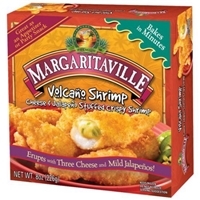 Shrimp, water, salt, sugar, disodium phosphate (to maintain flavor and firmness), citric acid, calcium disodium edta (to preserve color), sodium metabisulfite (preservative). 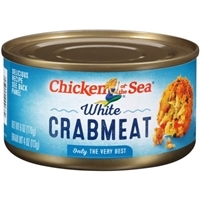 Crabmeat, water, salt, sugar, monosodium glutamate (to enhance flavor), citric acid, calcium disodium edta (to preserve color), sodium pyrophosphate (to maintain flavor and firmness), sodium metabisulphite (preservative). 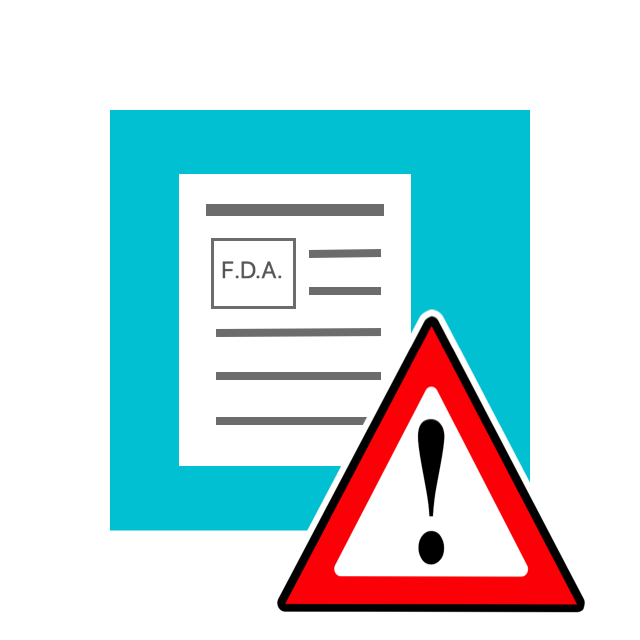 Clams in their natural juices, water, salt, sugar, sodium tripolyphosphate (to retain natural juices), calcium disodium edta (to protect color). 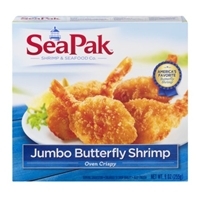 Shrimp, bleached wheat flour, vegetable oil (contains one or more of the following: soybean, palm, corn and/or cottonseed oil), cream cheese ([pasteurized cultured milk and cream, whey, salt, stabilizers (xanthan gum and/or carob bean gum and/or tara gum and/or guar gum)]), monterey jack cheese (milk, salt, cheese cultures, enzymes), cheddar cheese (milk, cheese cultures, salt, enzymes), diced jalapeno peppers, contains 2% or less of: salt, modified corn starch, sugar, whey, yellow corn flour, enriched wheat flour (with niacin, reduced iron, thiamine mononitrate, riboflavin, folic acid), cream, enzyme modified cheddar cheese (cheddar cheese (milk, cheese cultures, salt, enzymes), water, salt, enzymes, annatto color]), partially hydrogenated soybean oil, sodium phosphate, maltodextrin, egg whites, leavening (sodium acid pyrophosphate, sodium bicarbonate, monocalcium phosphate), gelatinized wheat starch, milkfat, sodium hexametaphosphate, sodium tripolyphosphate (to retain moisture), apocarotenal color, hydroxypropyl methylcellulose, yeast, caramel color, extractives of paprika, guar gum, xanthan gum, locust bean gum, calcium lactate, soy flour, nonfat dry milk, citric acid, sorbic acid (preservative), sodium benzoate (preservative), sodium bisulfite (as a preservative).contains: shrimp, wheat, milk, soy, egg. 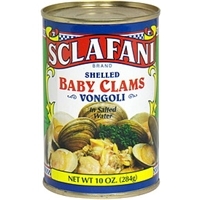 Clams, water, salt, citric acid added and sodium sulfite as a preservative. 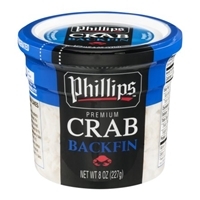 Brand/Manufacturer: Phillips Phillips Foods, Inc.
Crab meat (portunus spp, scylla spp, callinectes spp), sodium acid pyrophosphate (to prevent the formation of struvite crystals). 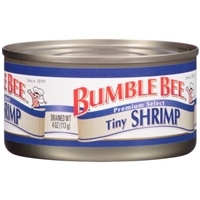 Shrimp, butter, water, soybean oil, contains 2% or less of each of the following: autolyzed yeast extract, canola oil, citric acid, corn syrup solids, dextrose, garlic (dried), lactic acid, lemon juice solids, lemon oil, lemon peel (dried), maltodextrin, natural flavors, natural garlic flavor, natural smoke flavor, natural white wine flavor, onion (dried), parsley (dried), red bell pepper (dried), romano cheese (pasteurized milk, cheese cultures, salt, enzymes), salt, sodium bisulfite (as a preservative), sodium phosphate, sodium tripolyphosphate (to retain moisture), spice extractive, sugar, thyme (dried), torula yeast.contains: shrimp, milk. 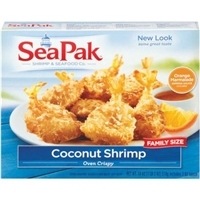 Shrimp, wheat flour, soybean oil, coconut, water, corn starch, contains 2% of less of each of the following: garlic powder, leavening (sodium acid pyrophosphate, sodium bicarbonate), natural flavor, onion powder, salt, sodium bisulfite (as a preservative), spice, sugar, sunflower oil, yeast extract, yeast. Dipping sauce: orange marmalade (high fructose corn syrup, corn syrup, oranges, sugar, citric acid, fruit pectin, sodium benzoate [as a preservative]), water, mustard (distilled vinegar, mustard seed, water, salt, spices, turmeric, natural flavor), horseradish (horseradish, vinegar, water, salt, soybean oil, sugar, flavoring, sodium bisulfite), pepper sauce (aged cayenne pepper, vinegar, salt), dijon mustard bran (mustard bran, salt, distilled vinegar, white wine, citric acid, tartaric acid, spices), mustard seed, potassium sorbate and sodium benzoate (as preservatives), natural flavors, salt, spice.contains: shrimp, wheat, coconut.